Bushworld: enter at your own risk. · One Book. One Author. One Hour. Bushworld: enter at your own risk. 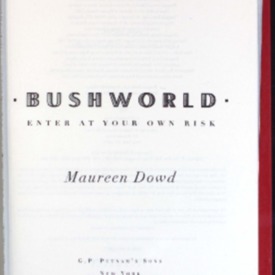 Dowd, Maureen, “Bushworld: enter at your own risk.,” One Book. One Author. One Hour., accessed April 24, 2019, http://booknotes.gmu.edu/items/show/675. Columnist Maureen Dowd discusses the political clout of the Bush family and the people surrounding the administration, including Cheney, Ashcroft, Rumsfeld, Rice, Rove, Wolfowitz, and Perle. "Bush, George W. (George Walker), 1946-"